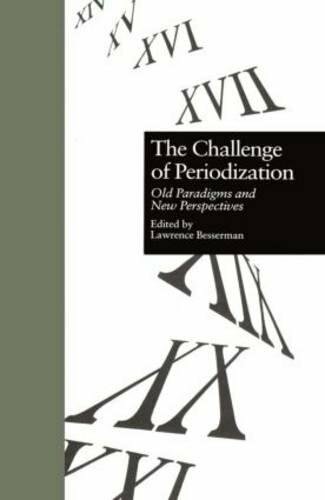 Periodization is a complex problem in history. History is in fact continuous, and so all systems of periodization are to some extent arbitrary. Almost every dynamic age is an "age of transition" as the cliché has it. It is nevertheless necessary to divide up history in order to make sense of the past and to articulate changes over time. Furthermore different nations and cultures experience different histories, and so will require different models of periodization. Periodizing labels are being challenged and redefined all the time. Thus an historian may claim that there was no such thing as the Renaissance, while others will defend the concept. The reasons for this are complex. Periodizing blocks will inevitably overlap, or even seemingly contradict one another. Furthermore, certain periodizing concepts only apply under specific conditions. Some have a cultural usage (but 'the Romantic period' seems to exclude Ingres). Others refer to historical events ('the Inter-War years: 1918-1939'), yet others are defined by decimal numbering systems ('the 1960s', 'the 17th Century'). Others are named from influential or talismanic individuals ('the Victorian Era', 'the Elizabethan Period', 'the Napoleonic Era'). Some of these usages will also be geographically specific. This is especially true of periodizing labels derived from individuals or ruling elites, such as the Jacksonian Era in America, the Meiji Era in Japan, or the Merovingian Period in France. Cultural terms may also have a limited reach. Thus the concept of the 'Romantic period' may be meaningless outside of Europe and European-influenced cultures. Likewise, 'the 1960s', though technically applicable to anywhere in the world according to Common Era numbering, has a certain set of specific cultural connotations in certain countries. For this reason it may be possible to say such things as 'The 1960s never occurred in Spain.' This would mean that the sexual revolution, counter-culture, youth rebellion and so on never developed during that decade in Spain's conservative Roman Catholic culture and under Franco's fascist regime. Likewise it is possible to claim, as the historian Arthur Marwick has, that 'the 1960s' began in the late 1950s and ended in the early 1970s. His reason for saying this is that the cultural and economic conditions that define the meaning of the period covers more than the accidental fact of a 10 year block beginning with the number 6. This extended usage is termed the 'long 1960s'. This usage derives from other historians who have adopted labels such as the 'Long Nineteenth Century' (1789-1914) to reconcile arbitrary decimal chronology with meaningful cultural and social phases. Similarly an Eighteenth Century may run 1714 - 1789. Eric Hobsbawm has also argued for what he calls the 'Short Twentieth Century', encompassing the period from the First World War through to the end of the Cold War. Similar problems attend other labels. Is it possible to use the term 'Victorian' outside of Britain? It sometimes is used if it is thought that its connotations usefully describe the politics, culture and economic conditions characteristic of the last two-thirds of the nineteenth century. Nevertheless periodizing terms often have negative or positive connotations which may affect their usage. This would include 'Victorian', which is often used negatively to suggest sexual repression, class conflict, heavy industry and so on. Other labels such as 'Renaissance' have strongly positive characteristics. As a result, these terms will sometimes be extended in meaning. Thus the 'English Renaissance' is virtually identical in meaning to the 'Elizabethan Period'. However the Carolingian Renaissance is said to have occurred during the reign of the Frankish king Charlemagne. There is a space of approximately seven hundred years between these two renaissances. Other examples include the 'American Renaissance' of the 1820s-60s, referring mainly to literature, and the 'Harlem Renaissance' of the 1920s, referring mainly to music. Because of these various positive and negative connotations, some periods are luckier than others regarding their names, although this can lead to problems such as the ones outlined above. The word 'Renaissance', meaning rebirth in French, was created by an Italian poet still perceived as belonging to the beginnings of the period, Petrarch. Its dominant usage still refers to the cultural changes that occurred in Italy, and which culminated in what is termed the High Renaissance at around 1500. This concept applies dominantly to the visual arts, referring to the work of Michelangelo, Raphael and Leonardo da Vinci. Secondarily it is applied to other arts, but it is disputed whether it is useful to describe a phase in economic, social and political history. Most professional historians (defined as paying members of organizations devoted to the propagation of history in higher education, like the American Historical Association) now refer to the historical period commonly known as the Renaissance as 'the Early Modern Period'. There has been no substantive change in the courses taught or books published to correspond to the change in period nomenclature, but this in part reflects differences between social history and cultural history. The timeframe is also slightly different, in that 'Renaissance' tends to refer to events over a much longer and generally earlier period than 'Early Modern'. The term Middle Ages also derives from Petrarch. He was comparing his own period to the Ancient or Classical world, seeing his time as a time of rebirth after a dark intermediate period, the Middle Ages. The idea that the Middle Ages was a 'middle' phase between two other large scale periodizing concepts, Ancient and Modern, still persists. Smaller periodizing concepts such as Dark Ages occur within it. Both 'Dark Ages' and 'Middle Ages' still have negative connotations, the latter especially in its Latin form, medieval. However other terms, such as Gothic architecture, used to refer to a style typical of the High Middle Ages have largely lost the negative connotations they initially had, acquiring new meanings over time (see Gothic architecture and Goth). The Gothic and the Baroque were both named during subsequent stylistic periods when the preceding style was unpopular. The word 'Gothic' was applied as a pejorative term to all things Northern European and, hence, barbarian, probably first in the generation of Francois Rabelais. The word 'baroque' (probably) was used first in late 18th century French about the irregular natural pearl shape and later about an architectural style perceived to be 'irregular' in comparison to the highly regular Neoclassical architecture of that time. Subsequently these terms have become purely descriptive, and have largely lost negative connotations. However the term 'Baroque' as applied to art (for example Rubens) refers to a much earlier historical period than when applied to music (Handel, Bach). This reflects the difference between stylistic histories internal to an art form and the external chronological history beyond it. In many cases people living through a period are unable to identify themselves as belonging to the period that historians may later assign to them. This is partly because they are unable to predict the future, and so will not be able to tell whether they are at the beginning, middle or end of a period. Another reason may be that their own sense of historical development may be determined by religions or ideologies that differ from those used by later historians. Lumping and splitting refers to a well known problem in any discipline which has to place individual examples into rigorously defined categories. The lumper/splitter problem occurs when there is the need to create classifications and assign examples to them, for example schools of literature, biological paleo-species and so on. A "lumper" is an individual who takes a gestalt view of a definition, and assigns examples broadly, assuming that differences are not as important as signature similarities. A "splitter" is an individual who takes precise definitions, and creates new categories to classify samples that differ in key ways. In history lumpers are those who tend to create broad definitions that cover large periods of time and many disciplines, whereas splitters want to assign names to tight groups of inter-relationships. Each approach has its well known problems. Lumping tends to create a more and more unwieldy definition, with members having less and less mutually in common. This can lead to definitions which are little more than conventionalities, or groups which join fundamentally different examples. Splitting often leads to "distinctions without difference", ornate and fussy categories, and failure to see underlying similarities.